Trip stands on the basketball court at Hinkle Fieldhouse, where he will still be this year but in a reduced capacity. Collegian file photo. 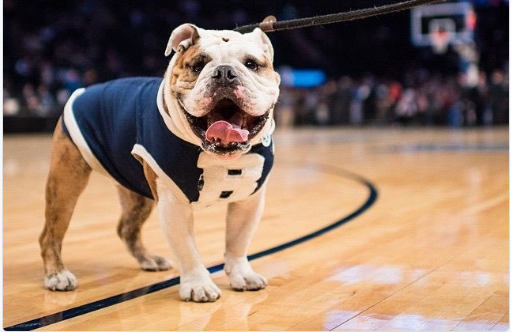 Butler University’s mascot Trip announced on Twitter he will be taking on a reduced roll in the coming weeks as he deals with a cyst on his paw and the discomfort that comes with it. The veterinarian diagnosed Trip, also known as Butler Blue III, with tendinopathy, along with arthritis. However, via lighthearted tweets, Trip assured his fans this isn’t his idea, but instead is listening to the advice of the humans in his life. The tweet said Trip himself will not slow down, but his workload will. Trip will not be attending the Blue’s Buddies launching event coming soon, but he isn’t going away. He will eventually return to light duty when the discomfort he’s experiencing goes away.